In my last post, I wrote that the majority of US companies destroy shareholder value. According to my figures below, 75% of US companies (50.9% of the market capitalization) are currently destroying shareholder value. How does a company destroy value? By investing in projects with poor prospective returns. Growth, due to investment in new assets, only adds value if the company can earn a return on the assets that is above its cost of capital. For example, let’s assume that a manufacturing business borrows $1 million from a bank to purchase a new plant and equipment at an interest rate of 7.5% per annum. The new plant and equipment generates $50,000 in incremental operating earnings. But has this growth in earnings created value for shareholders? No. It has destroyed $25,000 in shareholder value; since the interest cost of $75,000 exceeds the marginal increase in operating earnings. In a similar way, companies that invest in projects with low prospective returns destroy value for their shareholders. Unfortunately, not many companies can consistently earn a return on investment above their cost of capital. Why? Because industries where companies earn a return above their cost of capital attract competition. Each new business that enters an industry creates additional supply of products and services, pushing prices down. At the same time, the costs of companies increase as they spend more on advertising and other costs in an effort to differentiate their product or service from the market. The result of this is that, over time, the return on investment and the cost of capital converge. If the company’s return on capital falls below the cost of capital, the company starts to destroy shareholder value. In this scenario, shareholders would be better off if company management ceased trading, liquidated the company’s assets and returned capital to shareholders. But this doesn’t always happen. Companies can, and do, continue operating when with a return on investment less than the cost of capital. This is could be due to several factors. The company operates in a cyclical industry, experiencing alternating periods of high and low return on investment. Young, concept or start-up companies that are rapidly investing in assets. Industries where the barriers to exit are high. Unwillingness of management to close down the business and put themselves out of a job. Tightly held companies (e.g. family controlled) where majority shareholders have personal or non-economic/financial reasons for keeping the company in business despite low returns on investment. A small minority of businesses are able to postpone the inevitable fade in their return on investment. These businesses typically have what Warren Buffett describes as a “moat” – one or more attributes that make it hard for competitors to mount a serious threat to their business. I will pick up this idea of economic moats in a future post. That’s the theory, but what evidence do I have to support my claim? Once again, I’ve used Zack’s online screening tool for US stocks. I created a custom screen with two variables. 1414 companies currently have a return on investment less than zero. The worst company was VolitionRX (VNRX) with a return on investment of -19479% (I’m not sure how that’s possible*). 1871 companies have a return on investment that’s lower than the US 10-year Treasury Bond (2.2% on the 16/10/2014). Instead of investing further in their business, these companies could purchase treasury bonds. If they did, they would earn a higher return with less risk. Investors in total market index funds may be surprised to find out that, based on these figures, approximately 9% of the stocks in their portfolio are currently in this category. 3993 companies have a return on investment that’s lower than the long-term return on US shares. That is to say, these companies could earn a better return by simply investing in an S&P 500 index fund. Not only would the returns be better, they would hold a diversified portfolio of assets that is highly liquid. Investors would probably be better off if these companies returned their capital to shareholders, allowing them to find more profitable investments. I should point out that the data set contains some extreme outliers – companies with unsustainably high and low returns on invested capital. So the figures above need to be considered with a healthy dose of skepticism. That said, even if you remove the outliers, the fact remains that the majority of companies (by number) destroy shareholder value. 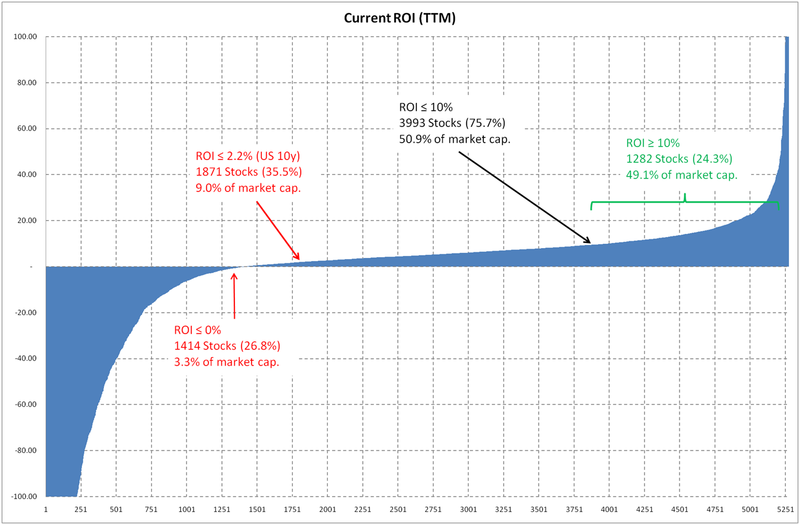 When you look at proportion of value creating companies (ROI > 10%) versus the proportion of value destroying companies (ROI < 10%) the result is approximately 50:50. It is unlikely that an unprofitable company could survive for long enough to grow and become a large part of the index. Also, once a company reaches a certain size, it develops certain advantages, such as economies of scale, which help to protect it from competition. This is why there are relatively few companies that are profitable, when measured by number, but a lot more companies that are profitable, when measured by market capitalization. I should also point out that just because a company has a low return on its current investments, it doesn’t mean that a company is unable to find better investments that earn higher returns and that can improve the companies possibility; although the evidence suggests that profitability (or the ability to earn a return above the cost of capital) tends to persist and is relatively stable. This can be seen in McKinsey’s excellent research paper (which probably deserves a post of its own): Balancing ROIC and growth to build value. Its important to remember that company accounts may need to be adjusted before a true return on investment can be calculated; as in many cases accounting figures don’t factor in all of a company’s assets. An example of this could be advertising, which is treated by accountants as an expense and not an asset. Think about a company like Coca-Cola, whose most valuable asset is its brand. In this context, advertising isn’t an expense, but rather maintenance capital expenditure, since advertising maintains the value of the brand. Treating Coca-Cola’s advertising spend as an asset will, all other things being equal, increase Coke’s assets and reduce its return on investment. Finally, it’s worth noting that just because a company is earning a poor return on its assets, it doesn’t necessarily follow that its share price will suffer. That said, I would argue that this is the more likely outcome over time. It’s more likely because such a company will eventually be forced to raise capital to continue operating. So if a company can’t earn a return above the cost of its assets, it will be forced to either issue shares or debt. Both come at a cost to shareholders. Issuing debt creates an obligation to pay interest, which reduces future earnings. Issuing shares dilutes or reduces each investor’s share of the company’s earnings. In contrast, a company that can fund its maintenance and additional capital expenditures out of retained earnings (because its assets earn a return above their cost) is the master of its own destiny. Provided that management are sensible, they can use the cash generated by earning a return above the cost of capital to grow the business in a way that creates value for shareholders. The good news is that there are still hundred’s of companies where there’s an opportunity to invest in a business that have the potential to create value for their shareholders. P.S. One of the themes implicit in this post is that its often easier to get the result that you want by first identifying the result you don’t want, then by identifying the underlying causes of that negative result, and finally by doing the opposite. For example, it can be hard to figure out what qualities make a good investment. A simpler way approach the problem might be to first think of all of the ways that a company can lose money or the reasons why it may be a bad investment. Obviously investing in assets where the return on investment doesn’t cover your cost is one way to lose money. Once you’ve identified all of the ways to lose money or pick bad investments, you simply do the opposite. In this case, the opposite is to invest in companies that earn returns in excess of the cost of their assets. The Jacobian way of solving problems makes a lot of sense to me. I think that it is humble, and therefore its stands a better chance of working and delivering a consistent result. What do I mean by this statement? In my day job, I’ve met hundreds of fund managers – many have told me that they know how to pick great companies to invest in. It is very hard for a fund manager to do this consistently. However, I get really excited when a fund manager tells me that, instead of trying to pick great companies, they’re trying to avoid poor ones. I refer to these fund managers as “humble” because they’re aren’t trying to convince me – or kid themselves – that they have any special insight when it comes picking winners. Instead, experience has taught these fund managers that companies with certain attributes make poor investments. The obvious corollary is that avoiding these companies leads to superior investment performance. Importantly, trying to avoid poor companies also requires less forecasting and fewer assumptions about the future; which is why I think the chances that it will work consistently are much higher. For a detailed explanation of how Jacobian thinking can help solve investment problems, I recommend Luke Wiley’s book: The 52-Week Low Formula: A Contrarian Strategy that Lowers Risk, Beats the Market, and Overcomes Human Emotion. * VolitionRX Limited is a life sciences company focused on developing blood-based diagnostic tests. The company has 7 employees, $0 revenue and reported a $3.31m net loss in 2014.